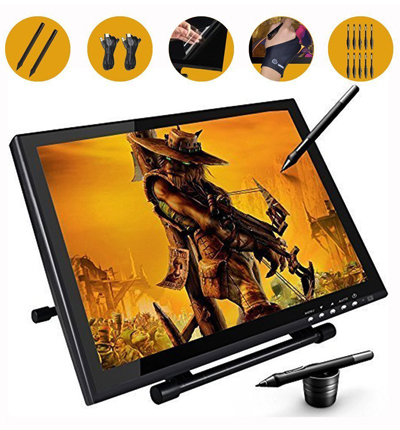 In a market of pen tablets and monitors dominated by a specific brand that has already established its place in the market, the Ugee 1910B Digital Pen Tablet stands out against the odds as one of the best. I was pleasantly surprised after trying out this digitizer. It is undeniably one of the best graphic tablets in the market, and it comes with so many gifts in the box! But I will discuss that a little later. But for the most part, be assured that it is worth both your attention and maybe even your cash. 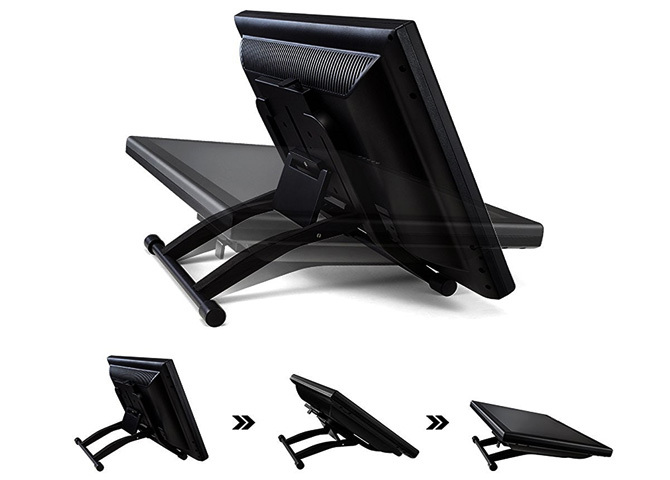 The stand of Ugee 1910b is built in, and you adjust the angle or height to your preferred angle or height except for completely flat because it is built for sitting on a surface like a table. So you can’t set it on your lap. It is made of black plastic that is beautifully designed. While it is not that thick, it is compact and solid. It is not the most lightweight out there, but it can be carried around a room if need be. It comes with many useful extras in the box, for example, a screen protector and a glove. The pen is battery free. Easy to use, since you are looking at what you are drawing. The pen pressure is great. Quicker finger-sensitive touch ring for real-time responses. The glossy and glassy screen makes glare an issue if put in the wrong angle. The resolution is not the best as the screen shows some pixelation. 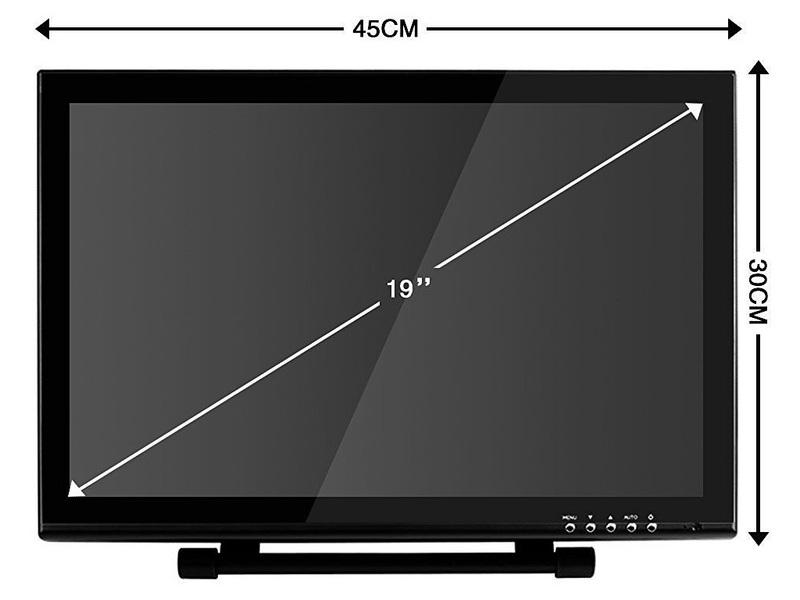 Ugee tablet monitor has a screen that measures 19 inches and as a resolution of 1440 by 900. The screen looks sleek for it is glossy and flat, and goes all the way up to the ends with only a black frame that is slightly less than an inch wide, leaving a whole lot of space for drawing. Also, the fact that it is flat enables the use of a stencil or ruler if you need to. You can also place another drawing on it and trace to transfer a drawing, the options are endless, as opposed to a screen that is raised or a screen with a frame that is raised. The glossiness also makes colors look brighter with enhanced contrast, and makes the installation of a screen protector quite easy, for it does not have to be cut to fit anywhere. Also, the fact that you draw on the screen and you get to look at what you are drawing is an advantage because you do not have to struggle will hand-eye co-ordination, as there is with screenless tablets. The pen is battery-free and cordless. It has a rechargeable battery, which lasts for800 hours at a minimum. Although, it could be less depending on how you use it. It is just light enough not to cause fatigue and heavy enough to balance as you draw. The tablet has a rubberized grip and a streamlined design. It is also packaged with one extra one pen, adding up the total to two. It does not have an eraser, but it has a button that toggles between the pen and the eraser function. The pressure sensitivity on the stylus is really good. It knows when you are just tapping, pressing hard against the screen or just darting the pen quickly across the screen and works similar to how real pens and pencils do. The Ugee 1910B comes with the tablet itself, two pens, two pen charging cables, USB and power cables, one VGA, one pen holder, one nib barrel, eight replacement nibs, one nib removal ring and a user manual with clear instructions to make installation a breeze. Free gifts inside are a screen protector to protect your screen from scratches and a glove to prevent smudging while drawing and also to clean the screen. It also has a Pergear clean kit for cleaning the screen. It is compatible with the Mac OS and Windows XP, Vista, 7, 8, 8.1 and Windows 10. It can also be used with the following programs that were tested, GIMP, Photoshop, Paint Tool Sai, Clip Studio Paint Pro and much more. I would advise you to do more research on its compatibility with whatever OS and software you have, just to be sure before buying it. See more details. Q: Why is it recommended that we download drivers from the website instead of the one that comes with the CD? A: Because they are more likely to be up to date than the one that comes in the CD. Q: The pen display draws in straight lines. What should I do? A: Try to unplug then plug the USB cable back. If this doesn’t work, try a different driver version, preferably the most up to date from the manufacturer’s website. Q: Is it necessary to charge the pen with the USB cable it comes with? A: It is not. It can be charged anywhere, even with a power bank. If it is charging, a blue LED light will be on, and it will go off once the battery is full. The Ugee 1910B Digital Pen Tablet is one of the best pen displays in the market that is totally worth your money and will deliver value for your money. You get to draw naturally and directly on the screen, and you see what you are drawing on the very screen. All that being said, I would highly recommend this to someone who is in the market for a new pen display. I assure it will not disappoint.